Our mid-speed capsule fillers designed to fill hard gelatin capsules with powder, pellets or granular materials. It is durable and reliable encapsulators that fill dosages to the highest accuracy. The operation is very smooth, low noise, simple to operate, and easy to maintain and clean. These machines are built to meet the worlds most advanced encapsulating production requirements. All parts are made of high quality stainless steel to meet the cGMP Standard. We integrated only SIEMENS electrical components and SIEMENS PLC for reliability. The filling dosage can be adjusted and the powder can be filled according to the volume requirements. All encapsulators come with one set of capsule sized changeable parts, a dust collection unit, powder recovery unit, BUSCH Dry Pump, a built-in air compressor unit and a water cooling system. 1. The powder column is compressed to be 1/5 thickness of dosing disk. 2. The powder column is compressed to be 2/5 thickness of dosing disk. 3. The powder column is compressed to be 3/5 thickness of dosing disk. 4. The powder column is compressed to be 4/5 thickness of dosing disk. 5. 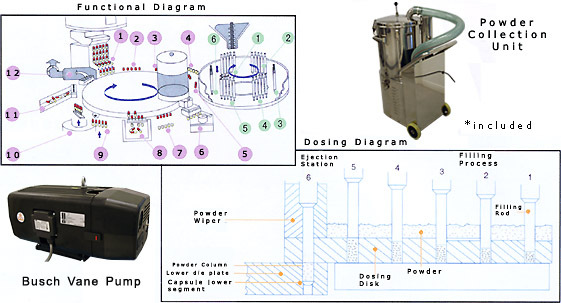 The powder column is compressed to be same as the thickness of dosing disk. 6. Fill the compressed powder column of proper dosage into capsules. 1. The capsules are fed to the segments in sequence, the cap and body are separated by means of a vacuum suction. 3. Cap and body are separated and prepared for filling. Capacity 54,000 Capsules/hr. 72,000 Capsules/hr. Copyright ?1997-2008 Vanguard Pharmaceutical Machinery, Inc. All rights reserved.